…without drastic cuts in global greenhouse gas emissions–more drastic than any being discussed ahead of the critical climate meeting in Paris later this year—a rise of 20 metres will soon be unavoidable. I’ve been exasperated by the last two IPCC Reports in their treatment of sea level rise. Michael Le Page in a special report for the New Scientist (paywalled) takes a look at some recent research and comes up with very different numbers. This means a 5-metre rise could happen only if the world remains at least 2°C warmer than in pre-industrial times up to the year 4100. That doesn’t sound so bad: it suggests that if we found some way of cooling the planet, we could avoid that calamity. Since then two massive glaciers in West Antarctica have passed a point of no return. If they go, there is little to stop the rest of West Antarctica. “The West Antarctic ice sheet is gone”, said Anders Levermann of the Potsdam Institute for Climate Impact Research in Germany. Of significance here is that Levermann was one of the authors of the sea level chapter in the IPCC report. The Aurora Basin is marked “3” on the map. The Wilkes Basin is immediately to the left of it. If these basins and West Antarctica go, there won’t be much left of Greenland. That gets you to 19.9 metres. It doesn’t include any additional loss from the huge East Antarctic ice sheet, which from memory comes in at 59 metres worth of sea level rise. During the Pliocene with warming 2–3°C higher than today, global sea level was 25 metres higher. 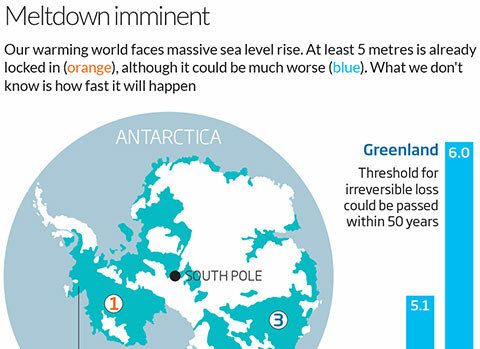 The big question is how fast the sea will rise. The short answer is, no-one knows. Yet in the improved ice model that Alley’s team ran, Antarctica alone added 5 metres to sea level in the first two centuries. 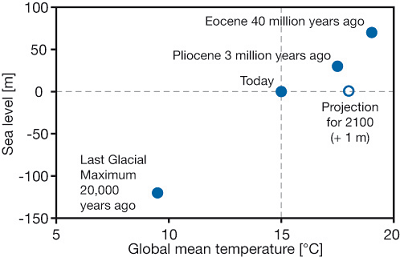 That model was run with warm Pliocene-like conditions from the start, not where we are at now. It might not take too long to reach a similar point, though. We’re in danger of soaring past Pliocene levels of warmth as early as the middle of the century if we don’t slash emissions soon. In the study, the West Antarctic ice sheet collapsed in mere decades in response to this kind of warmth. It’s highly likely, I think, that things will start to go distressingly pear-shaped during this century. 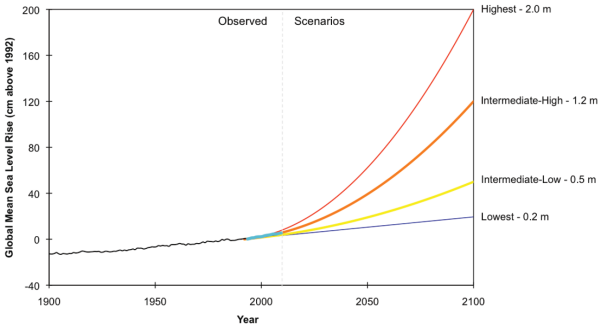 The scenario in prospect is very different from the gentle progression outlined by the IPCC. climate change has already committed the world to the destruction of human heritage many orders of magnitude greater than anything ISIS is capable of doing. * Update: I’ve changed the title from Scientists take sea level rise seriously out of recognition that the scientists who wrote the IPCC report took sea level rise very seriously indeed. It’s just that now their work needs updating, which was the point of the New Scientist article. Given your admitted penchant for hysteria and doom mongering and lack of any training or experience in the relevant science, I think I might ignore what you think and go with what the IPCC says. Karen your comment is needlessly brusque. Are you really dismissive of sea level rise or are you saying the IPCC is the only authority? Or are you just poking at Brian? You might also care to fire a salvo at PM Abbott whose climate credentials are really worthy of adverse comment. Karen: As you are aware I am convinced that climate change is real and that serious climate action is urgently needed. On the other hand, I have done enough modelling in my professional area to have some feel for the extreme difficulty of producing long term predictions of weather patterns, changes in ocean currents, glacier speed etc. This difficulty is complicated by many feed forward loops, tipping points etc. that make the process difficult. My take on the IPCC is that it prefers to be a bit on the conservative side so that it is less vulnerable to attack. The problem here is that some people may be making wrong decisions on the grounds that some changes will actually be a lot faster than IPCC predictions. It will take me a while to respond in full, but in the interim, Karen, if you are ignorant you don’t have to go with anyone unless you have to make decisions directly relevant to sea level rise. I understand you are in provincial Victoria, which isn’t under threat in normal human time-scales. It’s not compulsory to have a view about everything. I am also convinced climate change is real and action is urgently needed. I aware of the argument that is too conservative but I am also aware of counter-acting problems like publication bias. I suspect they come close to cancelling each other out. You are right Karen: The publication bias in parts of our media is pretty blatant. It is a bit hard to work out what the biases are in the more serious publications without seeing what was and wasn’t published in a field I know a lot about. Then there is the bias that comes from a research system that is strongly influenced by the grant system…. A court in the Hague has declared the Dutch government’s climate policy illegal and ordered it to cut its emissions by at least 25 per cent within five years, in a landmark ruling. To cheers from climate campaigners in the court, three judges ruled that government plans to cut emissions by just 14-17 per cent compared to 1990 levels by 2020 were illegal. Yes, jumpy, I enjoyed that, thanks. No wonder people on the right are against human rights laws. You never know what you might get! On publication bias, I don’t honestly think anyone hereabouts is in a position to make a sensible comment about climate change literature. My impression is that a lot of published articles are on very specific topics which don’t carry a general interest. I do think many climate scientists are conservative in what they write and what they say in public because they don’t want to be accused of scare mongering or scare the horses. We present a meta-regression analysis of the relation between the concentration of carbon dioxide in the atmosphere and changes in global temperature. The relation is captured by “climate sensitivity”, which measures the response to a doubling of carbon dioxide concentrations compared to pre-industrial levels. Estimates of climate sensitivity play a crucial role in evaluating the impacts of climate change and constitute one of the most important inputs into the computation of the social cost of carbon, which reflects the socially optimal value of a carbon tax. Climate sensitivity has been estimated by many researchers, but their results vary significantly. We collect 48 estimates from 16 studies and analyze the literature quantitatively. We find evidence for publication selection bias: researchers tend to report preferentially large estimates of climate sensitivity. Corrected for publication bias, the bulk of the literature is consistent with climate sensitivity lying between 1.4 and 2.3°C. Also, as I have pointed out before, climate change orthodoxy means literally billions of dollars are being poured into climate change research by governments and ngos that otherwise would go elsewhere. The peer reviewed literature contains dozens of papers on how conflicts of interest such as this bias science. conservatism – (publication bias + conflict of interest) = 0. Karen, I can’t see how I can have a sensible conversation on the basis of your link. I’ve had a look at the article and technically it is beyond me. I can’t see how their methodology produces the results they claim. I’d like to see a critique of their paper by someone who was competent in both the concept of climate sensitivity and research methodology. Meanwhile I suspect some bias of their own because the values they come up with for climate sensitivity (between 1.4 and 2.3°C) simply don’t make sense in terms of the paleo record. The best fit with other knowledge on global warming and climate change I find in the concept as handled by James Hansen and his associates who deal with the concept in detail in this 2103 paper and, yes, come up with a sensitivity of 3–4◦C for 2 × CO2 for fast feedbacks. For a simpler and less technical statement I’d point to his 2011 paper (see table on p 17) where he and his mates give truly scary values for fuller definitions and longer time scales. Elsewhere he says that it matters where you start from. Climate sensitivity has a different (greater) value if you start from 3 or 4 degrees of warming. This is where you get into the notion of runaway warming. I find the bias in the literature as concentrating excessively on fast feedbacks and ignoring the longer term effects. From what I’ve read, the concept of climate sensitivity suffers by an excessive concentration of models to the, in geological terms, short period for which we have observations. The risk is that Hansen and company might be right. Karen, I know that you’ll take the above comment as hand waving and confirming what you think about my work here, but I reject your charge of doom mongering and hysteria. What you need to take seriously is what Martin Weizman identified as low-probability, high-impact climate impacts. I did a post on it at the time (2008) but unfortunately there is a hole in the Larvatus Prodeo record and it’s in the hole. Luckily I can link to Peter Wood’s Garnaut Review submission. See especially Figure 1 which shows the long tail on climate sensitivity estimates. Peter also mentions the work of Hansen et al. and their use of “palaeoclimate data to estimate that climate sensitivity including slow feedbacks (sometimes known as generalised climate sensitivity) is approximately 6°C”. Peter reported at the time that he raised Weitzman’s work with Garnaut in an open forum. Garnaut was aware of it but essentially ignored it. Another case of conservatism. I recall that in the comments thread of my post climate scientist Roger Jones questioned the notion of “low” probability in this context. The concept of risk in climate change is important. Karen I obviously have to concede that I lack training or experience in climate science. I can read, however, and mostly what I try to do is summarise, précis and extract from the literature. Sometimes I’ve read enough to have a position or opinion. Sea level rise has been an interest for me. Back in the winter of 2008 I immersed myself in the literature and wrote five posts explaining the topic and its implications. Unfortunately all the posts are in the three-month hole in the LP record. Since then I’ve probably written 100 posts on the topic if Climate clippings segments are included. You can find some of them here, but the tag was not always applied. They include a post on Sea level rise: how much by 2100? That was in 2008. I took a tentative position then; I’d be less sure about it now. You can follow the IPCC if you like, but almost certainly you’ll be out of date from the time of publication. The problem is that what the IPCC says sticks as the received truth for the next 6 or 7 years until the next report. That was from a US government document of 2012. The graph had already been posted by David Spratt in mid-2011 with a line at 1.1 metres signifying the midpoint. Spratt’s post was about the Australian government unaccountably reducing their estimate from a midpoint of 1.1 metres to a maximum of 1.1 metres. So when the 5th IPCC report came out with 52-98 cm I thought “they’ve done it again”. The Summary for Policy Makers gave no rationale or reasons. Since then I hadn’t had time to check the full report, a forbidding document with a large section on sea level rise starting at p1153 on the pdf counter. Turns out that they give detailed reasons why they don’t accept all those studies as having sufficient certainty. You might suspect publication bias at work. They tend to discount the East Antarctica ice sheet and push forward real trouble from Greenland and West Antarctica to beyond the 2100 horizon. They talk about water refreezing in crevasses etc and new grounding line positions being formed to slow down glacier retreat. All this and more packed into models which are in a pretty primitive stage of development. There is a strict rule run across the research and discounting of known unknowns. I’m a bit impressed with the notion, from their report, that Greenland has lost 6.5 times as much ice in the decade 2002-2011 as it did in 1992-2001. The figure for Antarctica is 5 times. Since the IPCC report was published in September 2013 studies have found more contact between the ocean and the ice in Greenland than previously thought, including a river in the north that stretches some 700 km inland, and more activity in East Antarctica. At some time in the next 200 years we are going to lose our beaches, the ice sheets will start to look distinctly frayed around the edges and storm surges, river deltas and other low-lying areas are going to become problematic. Whether this happens this century or next doesn’t matter all that much, its our legacy over the next couple of millennia that matters. That’s if we stay on our present emissions trajectory. Even with mitigation and staying within 2°C, there’s trouble up ahead. I’ve changed the title to Sea level rise update out of recognition that the scientists who wrote the IPCC report took sea level rise very seriously indeed. It’s just that now their work needs updating, which was the point of the New Scientist article. Ian Joughin, one of the experts consulted in the NS article now think 1.2 metres by 2100 is in the ball park. … literally billions of dollars are being poured into climate change research by governments and ngos that otherwise would go elsewhere. It’s not. You’re wrong. Citation required. Spending on climate change research at 13 federal agencies would rise by a total of 6%, to $2.65 billion, over 2012 levels under the president’s 2014 budget request to Congress. Karen: The really big lie coming from the climate skeptic camp is that we have to choose between destroying the planet and destroying the economy. Even if you take the extreme fossil position and say that AGW is a complete myth we live on a planet where the world economy badly needs the sort of economic stimulation that came from WWII. Done well converting the world from fossil to renewable energy will provide the world economy with the stimulus it needs. Best of all, after the loans are paid off the world will have much much cheaper power than it has now. BTW, I am surprised that you think 2.4 billion worth of climate change research is all that large in terms of world research budgets. Also concerned that you think that all this money is going into proving that climate change is real. Karen, your thesis is not supported by your citation. Your original statement was that the money spent on climate research would otherwise have gone elsewhere. You have not demonstrated that this is the case. The US Budget expenditure could quite easily have been $2.65 billion less had the funds not been made available for climate research. Someone who demands intellectual rigor should display intellectual rigor. I didn’t say those things. You shouldn’t read anything in to what I’ve said. I agree that addressing climate change will not cost much. In addition to climate change, we should also be concerned about ocean acidification. Even though this is common sense, common knowledge and easily confirmed with five seconds of googling, he was convinced that it must be some wicked lie. Our comments overlapped, Zoot. I suppose it is possible that Obama could’ve simply put the unspent $US2.7 billion under his mattress (which is still technically elsewhere, btw) but if left unspent I think it would’ve went here. HMS Zoot struck twice by Karen class torpedoes directly amidship at waterline. HMS Zoot burning brightly, expect burnt to waterline and sunk, all hands lost. we should also be concerned about ocean acidification. Technically, that should be lowered alkalinity since we’re at 8.1 ph (aprox) and neutral is 7. We’re cool with that, right ? Karen: Clinton was the last President to balance the budget. Even better he boosted the economy at the same time. $2.65 is a mere crumb in a budget of $3.8 trillion. Still, according to Karen’s link it is only for the 13 federal agencies and more would be spent by universities and other institutions. More than half the $2.65 goes to NASA who have to keep satellites in the sky. I apologize for misspelling your alias, pure mistake. Yeah, I dunno, we have a datum of ph7. Like stationary in a car, if your driving on the road, decreasing from 100km/h to 60 km/h isn’t increasing reverse. Or if sea level is the datum in altitude, an aeroplane decreasing altitude from 1000 feet to 200 feet isn’t sinking. Anyway, that’s just my take ( non scientist ). a figure expressing the acidity or alkalinity of a solution on a logarithmic scale on which 7 is neutral, lower values are more acid and higher values more alkaline. The pH is equal to −log10 c, where c is the hydrogen ion concentration in moles per litre. Before the industrial era began, the average pH at the ocean surface was about 8.2 (slightly basic; 7.0 is neutral). Today it is about 8.1. Karen: Your US debt link showed interest at about $16,000 per sec. That is only about 4 times the rate that Warren Buffet makes money. Karen, you still haven’t defended your thesis (“I think it would’ve went” … really??) and you seem to have a shaky grasp of the concept “budget”. Jumpy, there is logic in your position, but “ocean acidification” is usage. In matters of language usage trumps logic every time. I would have thought that research on ocean acidification comes under the umbrella of climate change. Karen: You are thinking like a householder who sees money as something quite tangible. In the larger scheme it is a bit more elusive than that. Think of quantitative easing, all the money that magically disappeared during the GFC, inflation and the constant shuffling of currency values. John – you’re wasting your energy. Karen – I bet my remedial teacher could beat your remedial teacher. John, yes I’m aware of that, I studied macroeconomics at uni. I was thinking of opportunity cost, a concept that is probably beyond our four letter friend. My betting is that zoot understands perfectly well what opportunity cost is. Instead of banter over trivia, you might contemplate the fast-closing opportunity of doing something about avoiding dangerous climate change, and assess the importance of the funding in that light. Brian, Zoot’s inability to grasp the opportunity cost concept is self evident if you read the thread. We’re not dealing with Mensa material, I suspect. Why would it necessarily take hundreds of years to get a 20 Metre rise in mean sea level? Why couldn’t that happen in a single lifetime or perhaps two? Change in nature is not always gradual; sometimes it happens in surges – and infrequently, in exceedingly rapid surges..
Changes in oceanic pH have been mentioned – but what about all the other changes and potential changes? For example, what about the subterranean effects of a thick and relatively immobile mass of ice becoming a highly mobile and considerably thinner mass of water? No, I’m not panicking or becoming hysterical; nor am I obsessed with doom and gloom. I’ve simply accepted what I believe to be reasonably consistent and reliable evidence of inevitable climate change. Having accepted that evidence and always with a keen eye open for more evidence (whether for or against doesn’t matter), I am simply searching for ways of adapting to that change, perhaps even turning that change to advantage. Nothing wrong with that, is there? Karen: My understanding is that opportunity cost only kicks in if you have something better to do with the resources that are being used for say, climate science. Going even further, if we use unused resources to build renewable energy capacity that has a much lower running and health costs than those for fossil power, does this have a net negative opportunity cost (=opportunity profit)? Economics alone says we should get on and do it even in the unlikely event that the climate science has got it completely wrong. Karen, some blogs have a comments policy that says talking about other commenters is verboten. I’m thinking of doing the same thing here. Light banter can turn nasty quite easily. I know zoot does it too, just saying, watch it, please. I think you are edging into sarcasm. Why would it necessarily take hundreds of years to get a 20 Metre rise in mean sea level? Why couldn’t that happen in a single lifetime or perhaps two? [David Spratt] also found that during the Eemian 120,000 years ago we had three metres of sea level rise within 50 years with much gentler forcing than we have now, in probably the best analogue of what lies before us. Nope, all resource allocations have an opportunity cost. You’ve misunderstood the concept. Light banter can turn nasty quite easily. A little edgy banter spices things up. Zoot may be sulking at the moment but at least he has learned something. Of course I have no problem with the US fed govt spending $US2.7 billion on climate change research. My point is that without concerns about AGW, this pork would melt away and this creates a conflict of interest. There is plenty of peer reviewed lit on how conflicts of interest can bias science. It is also, dare I say, common sense. A study with a less alarmist estimate of sea level rise was published online a few weeks ago in Nature Climate Change. A summary is available on The Conversation website. Strikingly, our estimate of the increase in the rate of rise is consistent with the projections of future sea level published by the Intergovernmental Panel on Climate Change (IPCC). So when the 5th IPCC report came out with 52-98 cm I thought “they’ve done it again”. The range up to 98 cm is the IPCC’s “likely” range, i.e. the risk of exceeding 98 cm is considered to be 17%, and IPCC adds in the SPM that “several tenths of a meter of sea level rise during the 21st century” could be added to this if a collapse of marine-based sectors of the Antarctic ice sheet is initiated. (my emphasis) It is thus clear that a meter is not the upper limit. So whilst it would be quite nice to have a short walk to the beach from my central Victoria highlands farm, I’m not getting my hopes up. Karen it pays to read the articles you cite. The first is about recent and current measurements of sea level rise (SLR) not about future projections. It’s about satellites and tide gauges. Remember, we reported on the research in Climate clippings 139, Item 2. One of the authors, John Church, was joint co-ordinating editor for the SLR chapter of the IPCC report. To me he comes across and an excellent, careful scientist, but cautious in his statements and tends to underplay risk. I invite readers to read the full article from RealClimate by Stefan Rahmstorf. You’ll find a man frustrated, perhaps even exasperated by the IPCC. He argues for the inclusion of studies using the semi-empirical approach, saying that colleagues agree with him and cites the NY Times as saying that the IPCC is “bending over backward to be scientifically conservative”. Rahmstorf is a co-author of one such study (see graph in this comment), which came out with projections of 0.8 to 1.8 metres. He says that the models used by the IPCC assume no SLR from East Antarctica and underestimate the likely loss from Greenland. The New Scientist article justifies his concern. He cites Bernhard Levermann as defending the IPCC approach and saying that readers can “create” an upper limit which incorporates ice sheet response. Levermann was cited by the New Scientist article as being impressed with the recent research, so we hope for better next time. Levermann was one of the IPCC authors. Turns out that both he and Rahmstorf are professors at the Potsdam Institute. There were two problems with the IPCC 98cm citation. One as you say is that it is not a true upper limit. The other is that the table in the IPCC SPM (see p 27 on the counter) gives 82cm. That is actually for 2081-2100. You have to dig to find 98cm. As Rahmstorf says, what’s written there will be cited as the upper limit for 2001 in the press. It’s a minor point, but I can’t understand where Rahmstorf gets his 17% risk. Likely should mean 33% in the IPCC jargon, which I explained in this post. BTW, I find I did cite the paragraph about the Antarctic ice sheet in my response to the IPCC science report. I did read the article but it changes nothing. Of course there are outlier opinions that cut both ways. The point is sea level rise is tracking in accordance with the latest ipcc and you misrepresented what the ipcc said by not acknowledging that the 98cm upper bound doen’t take into account Antarctic ice sheet. It’s a minor point, but I can’t understand where Rahmstorf gets his 17% risk. Assuming a normal distribution of risk the 17% upside risk is matched by the 17% downside risk which is 34% or 33% if you don’t round the two tails up. In a nutshell, always looking for worst case scenarios is no different from always looking for best case scenarios. I can understand the psychological factors that make ideologues prefer extreme views but boring old me favours prudence and moderation. the 17% upside risk is matched by the 17% downside risk which is 34% or 33% if you don’t round the two tails up. If the worst case scenario happens and you have made your decisions on a better case scenario you could be facing a serious crisis that could have been avoided by doing something like not building below some RL. If the best case scenario happens we might have spent money on something that could have been done later or some developer may have missed out a land sale. 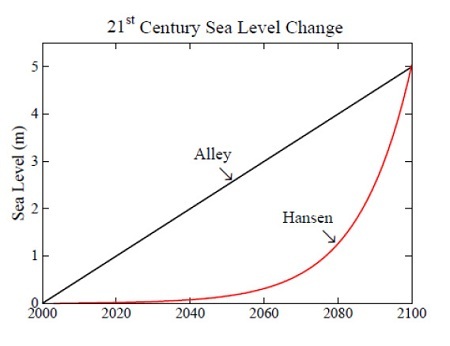 Keep in mind that what we are arguing about is sea level rise by some date in the near future which is expected within the lifetime of people who have already been born. 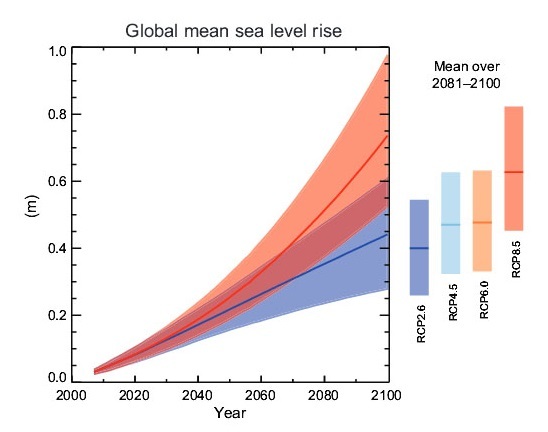 It seems extremely unlikely that sea level rise is going to stop by 2100. I think we should be guided by state of the art risk management principles. Remember, AGW is just one of millions of potential threats for which there is a plausible and very scary worst case scenario. Karen: Exactly what state of the art principles are you referring to? John, maybe not extinction. Even James Lovelock foresees breeding pairs taking refuge in the Antarctic! Generally it is considered that civilisation as we know it will be threatened at 4°C. That includes Potsdam chief Hans Joachim Schellnhuber. Scientists have very high confidence (greater than 90% chance) that global mean sea level will rise at least 8 inches (0.2 meter) and no more than 6.6 feet (2.0 meters) by 2100. As Stefan Rahmstorf said, planners need to guard against the worst case scenario. A dike that is only “likely” to be good enough is not the kind of safety level that coastal engineers want to provide; they want to be pretty damn certain that a dike will not break. Rightly so. 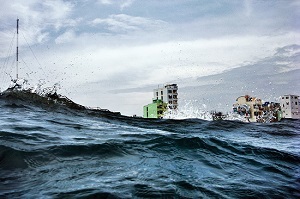 Planners and engineers also have to think about exceptional events, like storm surge. In Brisbane we live below the Wivenhoe Dam wall. From memory, a wall failure would see casualties of 100,000 or more. It would cut a swathe through Brisbane. A 10% or 5% chance of failure is not acceptable. We would rest easier with something like one in a million. It seems unlikely that planners and engineers in threatened areas can give that degree of safety from SLR, which is why climate change is dangerous and avoiding it should be accorded a high priority. To call such concern ideological is humbug. Brian, yes I agree those are realistic concerns that must inform policy decisions. That’s a no-brainer. The BS from James Lovelock on the other hand …. The main problem we have is denialism on the right of politics. Maybe a concrete and highly visible signature of AGW, such a sea level rise that puts the prime real estate at risk is what we need to get partisan action at the level that is required. Karen I read that as Lovelock acknowledging the difficulty of getting any action going and attributing that frustration to the right side of politics. Wivenhoe is a real and assessable risk – the hazards, elements and vulnerability can be seen and reasonable estimations made. And as Brain said, the degree of certainty of the calculations must be pretty high, like one in one million. Denialists will continue to obstruct climate change mitigation and will fuel uncertainty until some event shakes their bones and forces another view. In my balmy tropical region insurance companies are already either refusing home insurance outright in areas considered prone to storm surge or are offering insurance at a 500% (sic) increase in premium. You will find the same thing happening in North Carolina where homes on the beachfront have become uninsurable, or carry heavy caveats on their policy. Do you have the name of those insurance companies ? I’d like to divest, if I’m exposed, to these. Jumpy I’ll get those to you on Mon/Tues next. Divest from them? They might be the survivors if we get a big surge with a cyclone. Bear in mind that many of the areas are just a couple of metres above sea level. And much of Cairns is built on alluvium so if we get a ‘quake the damage could be high. No, I’ve linked to NASA data that shows a decrease in both cyclone activity and intensity in tropical; storms and hurricanes in the last 50 years. And much of Cairns is built on alluvium so if we get a ‘quake the damage could be high. The survivors are the insurance companies who lowered their risk. And past climate records are not great predictors of individual events. Earthquakes in FNQ? Yeah we get modest earthquakes from time to time. Last one around 2011 if I recall. Alluvium can amplify the effects of a quake so even a modest shake can cause damage. From gas? Nah. But Eastern Australia does have an interesting geomorphology if you care to look. Geoff, three years ago I had to go to Cairns for a conference, so I checked out the place for vulnerability to SLR. It doesn’t bear thinking about. According to paleoclimate evidence the equilibrium SLR for current levels of emissions is 25m plus or minus 5. According to the flood maps everything to the right of the highway as you drive towards Cairns from the south goes under water, just give it a few thousand years. But the central city itself is quite vulnerable to a metre or two, as is obvious from looking at it. How soon it will become problematic, no-one knows. Jumpy, I wouldn’t buy shares in any insurer other than Munich Re. The have the best database on weather effects of anyone. The average home insurance policy, take out today, wouldn’t be more than 20 years max. Any insurer that want’s to gouge me % 500 due to sea level rise is not getting my premium payments. Karen: One of the basic tools of risk assessment is a diagram that shows something like risk on the vertical axis and damage on the horizontal axis. It helps sort out what problems should be attacked first so that you don’t waste time on low risk/low damage issues. Unless a lot is done about AGW there is little doubt that AGW fits into the high risk/very very serious damage corner. OK some old fossils who make their money from fossil carbon may make a rational, but rather selfish decision on the assumption that most of the damage will happen after their rotten lives have ended. Doing nothing seems even more stupid when you realize that, if anything, what we need to do to fight AGW will provide the stimulation that our world economy desperately needs. Karen, concerning your comment, yep, I stuffed up over the 90cm and the 17% risk. I’m human and the maths I did at school didn’t deal with probability. I’m happy to learn. Concerning the 17%, likely in IPCC means at least 66%. So 17% risk is the midpoint of the happening zone. Re 98cm, I completely forgot about the Antarctic comment. In the SPM it does come two pages after the table, which is less than ideal. Our review of high-end post-AR4 sea-level projections suggests that a credible upper bound of twenty-first century sea-level rise is of the order of 2 m. Combined with the earlier estimates of sea-level-rise scenarios from the AR4, this suggests a pragmatic range of 0.5–2 m for twenty-first century sea-level rise, assuming a 4°C or more rise in temperature. However, since it is not certain that recent observed increases in ice discharge from the ice sheets will continue to accelerate, we must also be clear that the upper part of this range is considered unlikely to be realized. Of interest, in November 2013, just after the publication of the IPCC report, there was a survey of 90 SLR experts from 18 countries (Horton et al), reported by Stefan Rahmstorf at RealClimate. With successful, strong mitigation measures, the experts expect a likely rise of 40-60 cm in this century and 60-100 cm by the year 2300. With unmitigated warming, however, the likely range is 70-120 cm by 2100 and two to three meters by the year 2300. He says that 65% of experts expected a higher SLR than the IPCC. I wonder what they would say now! Thanks, Brian. It might be a good thing that so much prime real estate and hundreds of billions of dollars worth of economic activity will be threatened by any significant sea rise because this will force the right to take the issue seriously once it becomes a concrete reality. This is one of the reasons why I am much more relaxed about AGW than yourself. Karen, unfortunately the rich can probably get away with another generation of beach front home ownership. Apart from that we are lucky that Beijing and New York are in the firing line, along with Miami and Florida and the whole NE coast of the US from North Carolina up. Brian: The cost of a levy high enough to protect a million dollar plus house is not going to be overwhelming. I find that hard to believe but even if it was the case, so what? The property would be uninsurable and and it would have no resale value. I find that hard to believe but even if it was the case, so what? The property would be uninsurable and it would have no resale value. Karen: On the figures quoted in this post and comments a one metre high levee would be enough for quite a while. 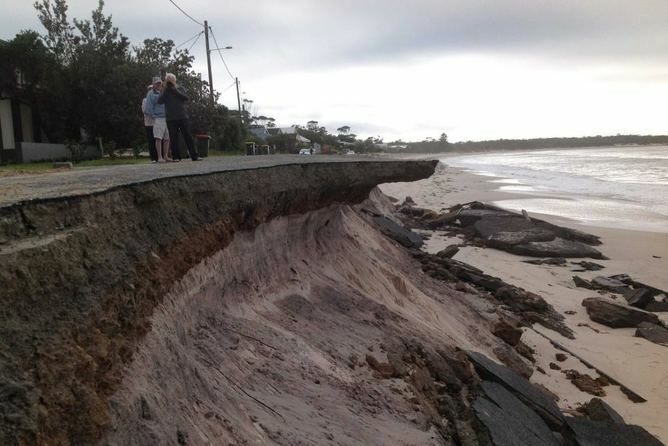 I believe that one metre on average will push the beach back 100 metres, through storms and storm surges. John, I think the problem is that the beach ‘front’ or ‘head’ is typically a number of metres higher than the high water mark. Storms attack the base of the beach front and the rest falls away. A beach head 20 metres high could be chewed out by a storm, depending on the consistency of the material its made of. Maybe so JD but the amount of prime real estate and economic infrastructure that is threatened by even a 50 cm sea level rise is horrific. A couple of short levees here and there will not cut it, you would need thousands of kms of the things. Sea levees may also be a hard sell post-Hurricane Katrina. They would also make a wonderful target for terrorists. It is worth checking out the various world map versions on the web with simulated sea level rises as it really brings it home. Business leaders are highly influential on the Right and I don’t see them letting this happen. I usually use these flood maps. Choose your level, zoom out, go anywhere in the world, then zoom in. Karen: I hope you are right about something scaring them. Brian: In Sunday school we used to sing about the foolishness of building on the sand. Certainly not smart in areas where coastlines and river banks move around all the time. It comes from this 2012 report. Frankly, I am quite surprised that the authors (ten of whom are also authors of the sea-level chapter of the upcoming IPCC report) display such unfamiliarity with the fundamentals of (and prejudice against) semi-empirical models. There seems to be something of a cleavage in the expert opinion. Then there is the option of going towards floating cities. Fixes the sea level rise problem. Solves a lot of problems in the future. Ive seen the ecosystems that develop under just one shipping container floating around for a while in the sea, imagine under those things ! I like the idea, but even with 60m from Brians flood map, we still have plenty of land.